How Many Needles Does a Porcupine Have? Given the choice of an encounter with a skunk and an encounter with a porcupine, and hindsight considered, most dogs would prefer to take on the skunk. At least the skunk’s defense can be washed off and won’t require surgery. Porcupines are not social and not aggressive, preferring to avoid than to attack. But attack they will, if provoked. In that case, only a small portion of the porcupine’s approximately 30,000 needlelike quills penetrate the attacker's skin. The myth that a porcupine can throw quills with his tail is inaccurate -- quills release easily and penetrate skin, but only following contact with the interloper's sking. A sturdy porcupine tail can easily insert quills into attackers, leaving the unfortunate predator filled with regrets and quills. 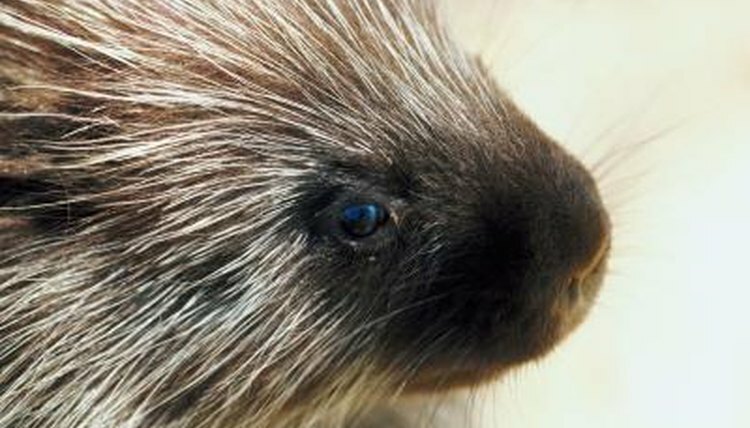 Porcupine defenses protect these slow-moving, nearsighted animals. Most animals avoid porcupines, innately aware of their danger. The porcupines, meanwhile, rather than rely on just quills, they have an early-warning system: Humans might not detect the first signals, but animals with far better senses of smell will retreat from the noxious odor that some porcupines release when alarmed. They might clack their teeth in warning to the predator. If the intruder remains, the porcupine changes stance, turning his back to the aggressor and raising his tail. It’s the tail’s contact against the attacker’s body that causes memorable pain. It’s doubtful that most animals will ever need a second lesson. Medical professionals recommend relying upon a veterinarian’s or physician’s surgical skills to extract these barbed weapons. Quills are modified hairs tipped with tiny barbs; the overlapping barbs point away from the tips. The longest quills are on the rump and tail, and the shortest are on the face. The porcupine’s stomach is the only part of the body that is quill-free. Porcupines have up to 100 quills per square inch. When embedded in an predator’s muscles, the creature's movement works the quill into the tissues, the quill migrating deeper into the body and sometimes puncturing veins or organs. After a porcupine releases quills into a predator, the quills regrow, although it can take four to six months. Fortunately for the victim, not all of the creature's quills are used in one defensive effort. The numbers of quills released in a single counterattack varies, but reports exist of 500 quills piercing an unfortunate dog's face. University of Michigan Kids Inquiry of Diverse Species: North American Porcupine Erethizon Dorsatum, What Do They Look Like? How Does the Chinchilla Protect Itself? How Do Porcupines Communicate With Each Other? Do Porcupine's Quills Grow Back? How Do Bearded Dragons Scare Away Predators? African Hedgehog Facts: Why Is the Skin Loose on Their Back? Can Both Male & Female Skunks Spray Scents? How Does Flea Medicine Work?